Review: Tomoya is a rather laid back high school student, rarely attending classes, having very few friends and no particular interest in anything. After his mother died his father lost his job and became an alcoholic. In fight with him his right arm got injured so bad that he can’t play basketball anymore even today. Even though his father feels guilty for it Tomoya still hasn’t forgiven him. By chance he meets Furukawa on his way to school and somehow gets involved with her more and more. 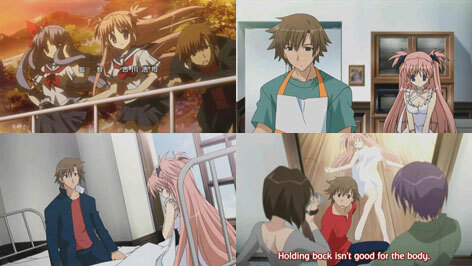 Furukawa is a clumsy girl who missed a year of high school because of sickness and now all her friends have graduated. Both having not many friends they start seeing and helping each other very often. Will she be able to make him walk into a better future instead of sulking over the past? 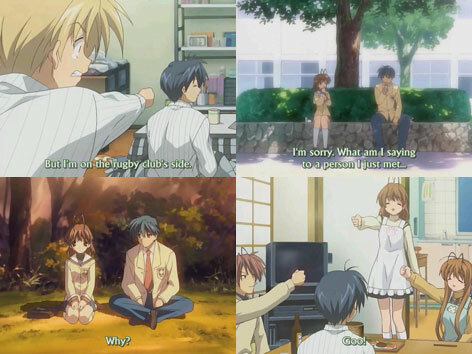 Clannad is yet another masterpiece by KyoAni who brought us shows like Air; Kannon2006, Suzumiya Haruhu and Lucky Star. When KyoAni is working on a project, great animation quality and plot are guaranteed so I doubt there is a possibility for this show to flop. The main character is designed perfectly credible and realistic as always and the plot has great potential for development and drama, while never missing out on the comedy part. Review: So here is seemingly yet another anime adaptation of an anime-game that is famous for its extraordinarily amazing artwork and story. Hirono Hiro is an active mangaka and therefore quite busy and often skips school. On Christmas Eve he bums into a mysterious girl from his school, who he didn’t know until now as she is also often skipping classes. It seems from today on their ways will cross each other more regularly. On the other hand there is Renji who happened to meet a girl called Chihiro at a deserted rail road. They are both interested in literature and it didn’t take them long to get interested in each other as well. But there is something that Renji finds odd about that girl and it isn’t only the fact that she is not attending any school for some reason. What Renji does not know is that she has a mental illness that makes her constantly forget anything that happened before the last 13 hours. Still she is trying her best to stay friends with him and not be a burden to the people around her. As this amazing story continues we will get to know more characters, their problems and how they are all connected with each other. Ef is a more drama and story oriented anime, unlike all those other harem/comedy anime game adaptations that flood the market each season for the last 5 years. 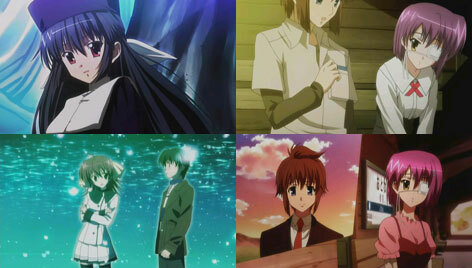 The unique animation and camera-movements, same as the serious themes and topics that each of the characters are dealing with in their own ways, is what makes this show different and probably the best series this season even while competing against KyoAni’s Clannad and all those second seasons of well established anime that are airing currently. Review: Kouichi’s parents are currently living overseas so he has to manage to live on his own together with his little sister. 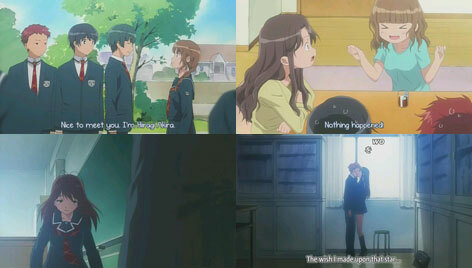 When suddenly the doorbell rings, it is not his parents but his childhood friend Mao returning from overseas while Kouichi’s parents agreed for her to stay at their home. To Kouichi’s surprise Moa isn’t the study obsessed nerd she used to be anymore, but rather grew up to be quite the energetic beauty. Now he seems torn between the growing feeling he starts to have for her and the feeling he has for his long-shot high school crush. Kimikiss is a lighthearted high school romance/comedy show dealing with multiple people, their problematic relationships and puberty. To this point it seems quite different to the KimiKiss manga, while I’m not able to compare it to the dating-sim game it is based on. If you are not already into this kind of thing, this anime probably won’t change your mind. Review: Minami-ke portrays the (ordinary?) 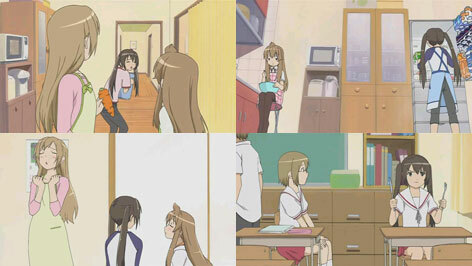 daily life of the 3 sisters Haruka, Kana, and Chiaki at home and at school. Even though they are sisters they possess very different personalities. This series is mainly about comedy and comparable to shows like Azumanga Daioh and Ichigo Mashimaro. So even if there isn’t much of a development, it can perfectly live only on comedy. Review: So here we go again with the third installment of the popular Da Capo series based on a game of the same name. Again the story is set on this mysterious island where the sakura trees never cease to bloom, but this time it’s 53 years in the future. We are following the daily lifes of all the first season cast’s grandchildren and our new protagonist already gets confessed to in the first episode. Yet I find this series to be rather weak in every aspect. There just isn’t anything special to it anymore. Continuing a finished project just because it was a little successful is ok if you have creative heads who think of new ways to go and not just on the potential profits of an already established brand. 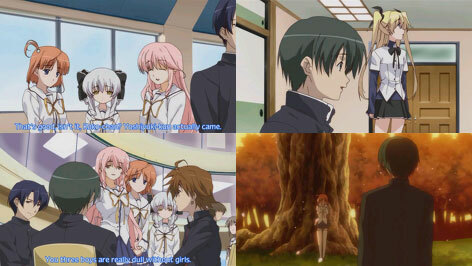 I didn’t play the games, so I don’t know if I should be angry at the game company or the animation company for messing it up, but what I’m certain of is that this anime is just a weak shadow of it’s first season, but still maybe worth watching for fans of lighthearted harem anime shows.